The Labour party has proposed increasing the rate of corporation tax from 19% to 26% by 2020. Their calculations show this could raise up to £19.4bn per year, giving a Labour government a large chunk of the funds it would need to follow through on its manifesto pledges. The Conservative party, however, want to cut the tax to 17% by 2020. These opposing approaches have provoked much discussion, with considerable misinformation being spread. Below we break down the facts. Corporation tax is a tax on companies’ profits, currently set at 19%. Put very simply, if a company makes £1m profit, they would pay £190,000 in tax. How high is UK corporation tax now? Our corporation tax rate is one of the lowest in the OECD group of economically advanced countries. 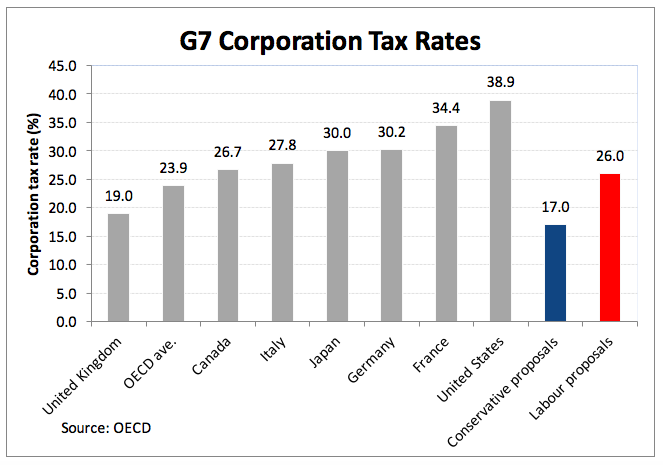 We have the lowest rate of corporation tax in the G7 group of leading nations. Even Labour’s increase to 26% would only put it slightly above the OECD average of 24%, and as the graph illustrates, it would be lower than any other current G7 rate. Why is it a problem to increase the UK corporation tax rate? Concerns have been raised that increasing the rate of corporation tax will discourage investment in the UK, encourage companies to shift profits abroad and ultimately lower economic growth. Arguments have even been made that lowering the rate of corporation tax increases tax receipts. Has a reduced rate of corporation tax increased receipts? No. Tax receipts have stayed pretty stable over the past few years despite economic growth. Corporation tax has been cut six times since 2009, and revenues only reached their pre-recession levels in 2016. This is particularly damning as the economy grew 6.6% in that period. The combination of a supposedly more lucrative tax system and economic growth should see receipts rise. As this didn’t happen, it's clear the lower rate does in fact not bring in more revenue. The graph below illustrates receipts from the first quarter of 2007 to the first quarter of 2017. 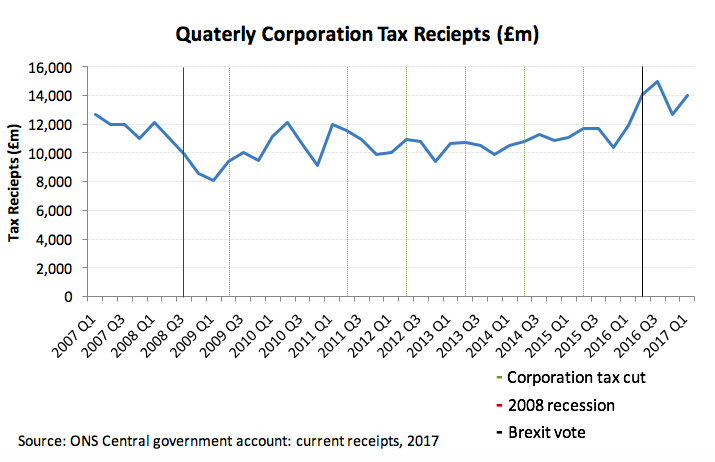 Receipts dipped after the 2008 financial crisis, and despite both economic growth and corporation tax being cut from 30% to 20%, receipts only reached the pre-recession levels in mid-2016 – after the Brexit vote. Receipts surpassed their pre-recession peak after a post-brexit surge in profits. An explanation for this increase is the pound’s collapse following the referendum, which made exports cheaper. Will a higher corporation tax rate lead to lower growth? No. Germany’s economy grew 1.9% in 2016 compared with the UK’s growth of 1.8%. This is despite their 30% corporation tax rate. The US had slightly lower growth of 1.7% and a rate of 38.9%, more than double that of the UK. In 2015, the US’s growth rate was actually greater than the UK’s (2.4% compared to 2.3%). Will a higher corporation tax rate lead to lower private investment? Lower taxes have not resulted in higher levels of private investment. As the graph below shows, business investment in the UK has been sluggish since the recession, and has even fallen in 2016. Companies aren’t investing in the economy, despite making healthy profits and increasing their own financial assets. Returning corporation tax to OECD average levels will at least boost UK government funds for investment. Why should companies pay more corporation tax? Companies benefit from public spending. The NHS cares for their workers, the police keep their businesses safe. Our schools, universities, and technical colleges educate and train their workforce. Our roads and publically subsidised rail networks allow goods and people to move efficiently and speedily across the country. Put differently, businesses need public spending as much as we do. If the UK enters a race to the bottom over corporation tax rates, as the Conservative proposals do, then we all lose. There needs to be international cooperation to ensure that tax haven economics aren’t the go-to model for growth. The evidence does not demonstrate that the Conservative party's reductions in corporation tax rates resulted in increased tax receipts and private investment. Corporate tax avoidance has long been a feature of business behaviour, but this should be met with measures to clamp down on profit shifting - not with a reward of a lower tax rate. We believe the best way to achieve strong long term growth is investment, not a low tax economy. Lowering corporation tax has not increased tax receipts, incentivised investment, or tackled the UK’s low productivity growth. It is time for a different approach, we need to invest, and the extra £19.4bn raised per year will go some way in providing this investment. Work areas: Economy and Industry. Tags: corporation tax, general election.